On Saturday, I was on ABC giving an interview about Design Anthropology. I'm too afraid to listen to it, so tell me how it went. <grin> I hate radio interviews because I always feel so inarticulate. But it was fun to do and I spent the rest of the day at the National Gallery of Victoria, where I got my first exposure to Aboriginal Art. The art work was exceptional and there were lots of video commentary available that talked about the artists. I find it difficult to interpret the paintings, but yesterday after a visit to the Oonah Indigenous Learning Center, Miranda Madgwick gave me some worksheets on understanding the symbols, as well as my most prized gift, one of her paintings. 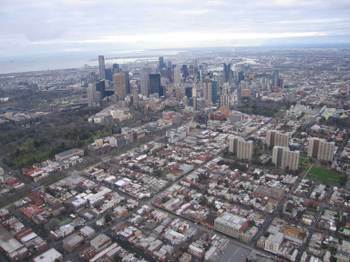 Here are some images from my hot air balloon trip this morning over Melbourne. It was a great way to view the city and suburbs. The first is the total view of the City and the Port. With the Yarra River, Melbourne could be Chicago's twin in terms of be former-industrial, now designerly, flat city next to large body of water. The skyscraper downtown is nestled in the river and the shore. 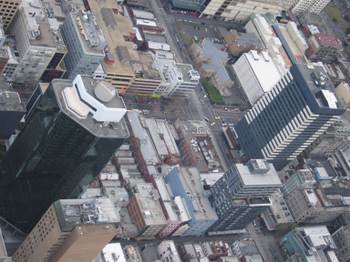 The second is of the shot by the balloon within the City. You cannot get views like this from a observation tower. 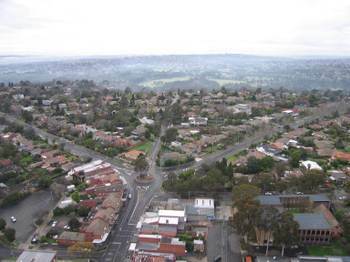 The third is the view over the affluent suburbs of Melbourne with the McMansions, swimming pools, and tennis courts. So yesterday before my presentation, I had the opportunity to explore. Walking the streets of Melbourne is not too different from walking the neighborhood streets of Chicago. You find mostly 1, 2, to 4-flats of eclectic architectural styles. One block may consist of rows of one-story brick houses with ornate Indian-style porticos, shutters, and gates. The next block may have a row of stucco-like, modern apartments that remind me of the suburbs of Silicon Valley in California. Around the corner, you may pass the pharmacy, boutique clothing stores, bakeries, take-out Asian food shops, record stores, cafes, book stores, vintage stores, and bead shops. 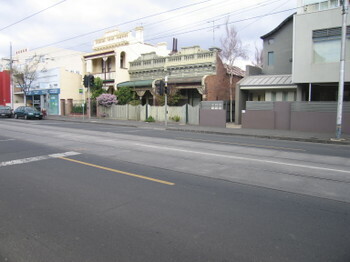 In the morning, you cross paths with young white and Asian students dressed in purple or blue blazers with tartan skirts and knee socks if females or solid slacks if male; white-haired pensioners waiting for the tram or shuffling to the supermarket; pin-striped suited business men holding meetings through their Bluetooth ear pieces; fashionable business women in high leather boots; working class blokes in jeans and pull over sweaters; young Indian women with bindis and leather jackets walking with their mothers in shalwar kameezes; and Asian shop-keepers sweeping in front of their sushi and fish and chips shops. You might encounter one or more people of African-descent, who pass by without directly acknowledging your common complexion. Yesterday, I had breakfast at a café of Chapel street (the main hipster drag) called Amici. It has a mixture of sophisticated youngish to middle-aged people either chatting in groups or solitarily drinking coffee and reading the newspaper or working on Mac laptops. I felt comfortable like I do at Meli’s in Chicago or the City Bakery in NYC. I mostly ate, prepped for my presentation, and did people watching. The guy sitting next to me was a very lonely guy working on his Mac laptop. He kept oversharing with the waitress as she brought him more latte. He kept offering up more details about his life as she tried to politely extricate herself from the conversation. After breakfast, I went to the Grenville Bookstore, which was said to have a good collection of design books in the area. It was very cozy. The shop woman pointed out some good Australian female authors although she was originally flustered by my request. She said, “I should probably know who these women are, but I don’t read authors by nationality.” It’s probably an anthropologist thing, but I do read authors by nationality. I took some photos of the streets and the park nearby. I was fascinated by the pedestrian crosswalk sign of a pair of black feet and legs on a yellow background. I passed by a bikeshop that had my red bike that I covet with the bell and basket on the front. Surprisingly enough, there must not be a lot of bike theft in this area of Melbourn because people use on flimsy locks or in some cases no locks at all on their bikes. There are a good number of bike riders on the streets, although I imagine it being kinda scary for me with the trams and cars. After my fabulous talk, I waited around until being able to have dinner with Ken and Daved Barry (a speaker who is visiting Swinburne) and later joined by their families. Ken, Daved, and I had a wonderful intellectual discussion about a variety of topics as well as sharing life histories. It was so much fun. This morning I was struck by the number and diversity of cafes in the Prahram area of town that I’m in. In such of a breakfast/writing café, I passed by tiny wood-paneled places full of university students gossiping, more bar-like bistros full of middle aged men drinking espressos and reading the paper; large chrome, mirror, and fern plates cafes with groups of women and their baby strollers chatting, and quick breakfast joints where you grab a donut and coffee for 5 AUD. The music wafting out of the cafes range from classical, ambient beats, top 40, until the place I stopped at the Yellow Bird. The Yellow Bird is best described as punk-ish. The walls are covered with posters for independent bands. I ended up selecting it because it was the place where I saw people working with Mac computers and a plug in. There was a sign for free wifi, but the wifi was broken. The music was different from what I imagined from the posters; Stevie Nicks and The English Beat. I was seeking pancakes, but they only had strawberry crepes. One great thing about Melbourne is that you can get excellent tea. They had three varieties of loose leaf green tea. I plugged in and worked on my still overdue essay comparing ethnography’s use in anthropology, marketing, design, and policy. I felt like I did writing at the little café/restaurant that I used to write at when I lived in the Southport area of Chicago. I wrote for a while, listening to the music, watching the people in tattoos, pink-red hair, all dressed in distressed black, come in and out, sit a read the paper, talk on the mobile, or chat in groups. I did not want to eat both breakfast and lunch there, so I walked further down the block and had lunch at this Pan-Asian restaurant. It was more sparsely populated being a very large space. The other customers were a white middle-aged business-like couple, who were deeply engaged in some business deal; a middle-aged Asian man having Udon soup alone in the back, a 20ish young white couple newly in love by the way the held hands and stared at each other across the table; a middle aged white male reading a novel, and myself. It’s funny that I keep saying middle-aged as if I’m not, but when I say middle-aged I mean people at least 10-20 years older than I am am. After lunch, I walked towards the flat, but stopped at the grocery store on the way back. I am amazed by the rows of Asian brand foods available everywhere, not in just the Asian section of the store. I imagine that it is like shopping in China town in NYC, except that its just the normal store. This is a kinda cool difference. I ended by wanderings back at the flat where I am waiting to attend the Australia rules rugby game tonight. This is sort of the the Chicago equivalent of getting the Cubs experience. I am not a big sports person, but it would introduce me to an important segment of the Melbourne population, although with my tea with Caroline Barnes, she said that most Melbourne people are more into culture and the arts, than sports like Sydney. I’ll find out in a few hours. So my reason for coming to Melbourne was to give a keynote presentation to Swinburne University and Design Victoria. I am happy to report that my presentation was a super smash hit. There was a list of 92 people who wanted to fit into the slot of 70 seats. Both the Design Victoria and Swinburne people said they have never had an event with such a diverse audience of Melbourne design schools, the local design industry, and there was even a women from the US Consulate. That freaked me out a bit until she said that she studied anthropology. I may have a future in the state department yet. I feel indebted to David Womack of Adobe Think Tank for editing my Design Anthropology article such that it was accessible to a lot of people. This was the basis of my talk and the audience really got it; the value and applications of design anthropology. They were able to ask such wonderful questions because David made me explain everything in the most simplest of terms and with tremendous clarity. So as much as I like to trot out my SAT vocab and convoluted theoretical arguments, there is something rewarding about clear and simple communications about something you love. It is especially rewarding when people are able to feel both empowered and inspired, and maybe a little intimidated, by what you have to say. In spite of my two typos, people came up to me and said they found the presentation amazing and hoped that I come and speak again. It was an important reminder that what I am doing is not just cool, but really is meaningful to people. I like that. So I arrived safely yesterday in Melbourne after a long series of flights from Chicago to LA, LA to Sydney, and finally Sydney to Melbourne. I was able to sleep, read (I finished one and a half novels on the ride), and write (until my battery ran out) during the more than 15 hours in transit. My first impressions of Melbourne is that it looks like flying into Chicago. Meaning, there is a long coast line, with the city center of skyscrapers near the shore, then flat land all around. Even the brink and wood bungalow and row houses remind me of Chicago. Stephen Langdon from Swinburne picked me up from the airport. He is nice with a great sense of humor. We drove through the various sections of the town — the Docklands, which are the redeveloped harbor area; the warehouse area, and the small commercial corridors. There is a lot of new construction, with mostly mixed residential and retail mid and high rises. There seems to be lots of parks and there is, of course, the sea. For the next few days, I hope to avoid getting hit by a car because they drive on the left side of the street. I kept getting into the wrong side of the car. Demographically, Melbourne seems mostly Anglo-Saxon and Asian (East as well as Southeast). The Design Faculty is located in Prahran, which you can tell was formally the Indian ghetto because the architecture has lots of Indian wood and lattice work. 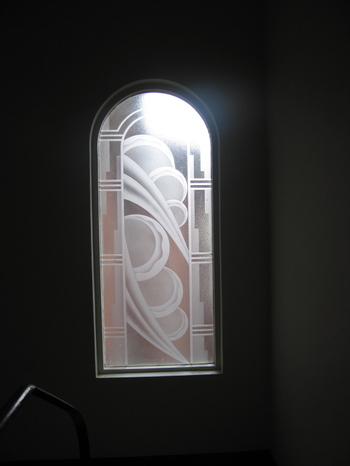 My flat is from the 1930s and decorated in a gorgeous Art Deco style. I feel really comfortable in it. It has heating lights and a Jacuzzi tub in the bathroom (it would be 4 star because the bath and the toilet are in separate rooms tee hee), plasma TVs in almost every room (but there are only 4 channels so it does not matter), two bedrooms, living room, and a fair-sized kitchen. Most importantly, it has high speed internet. Tee hee. I will spare you the images because you can find them here, but I will include one image of the Art Deco door. It was a good starting day. I will describe more about today later tonight when I get in. It's about 5:10pm here in Melbourne. Last night at UIC, Saki Mafundikwa gave a lecture on design and development in Zimbabwe. I hope to have more time to recount how poignant and amazing it was, especially what he is doing with his design school ZIVA. I have to get ready for today's black designer's forum, so stay tuned. I was going through some of the images from the Opening Ceremonies for the Olympics in Beijing. I am always struck by how mono-ethnic all the other nation's teams look compared to the US. The only European nation that was not mono-ethnic looking was Portugal, another reason why I love that place. Brazil was out is its multi-ethnic-racialness, but everyone else was looking pretty homogeneous. One would think that the world would be different by now with all the globalization and immigration, especially around sports, which tends to be more open than politics. Since I don't have a TV, I will miss almost all of the Olympics, besides my indifference to everything except Track and Field, which as been tarnished by doping scandals. The US gets a gold for diversity, now if only we can work on Congress.